Nanaio Bars do not seem to have a definitive origin, athough the sugar laden treat appears to have come from the Vancouver Island city of the same name. Surfacing on a larger scale following publication in various small town cookbooks this particular dessert quickly began to appear throughout North American, in both homes and restaurants. We recall our Mother making Nanaimo Bars around Christmas, sometime after we were stricken from Santa's gift recipient list, we believe in the very late fifties. And they were an instant hit in our home. Especially, including two layers of chocolate in this three layer concoction, popular with the ladies. We are not so much into dessert consumption as we are into creating delicious desserts. which we do admit requires tasting. We too enjoy dessert with our once a week extravagant meal (Saturday or Sunday evening), but dispose of the left-overs on Mondays, (always saving a slice for our "garbage man" on Tuesday mornings). As anyone can see by this recipe collection, we've made hundreds of sugary dishes in our time. Some we've searched out in books and libraries, others come from Larouse or the Silver Spoon, or gthe French Laundry, while still others come from aging French cooking pamphlets collected years ago. And we've made and have listed here many family favorites. 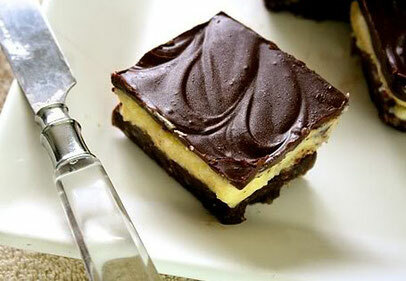 Yet we have to say there are few we make that are as jaw vibrating sweet as Nanaimo Bars. On our first attempt we lived on Broder Crescent in Morrisburg. We had been talking about Christmas baking and my sugar loving partner announced she would like Nanaimo Bars. I had a new mission to carry out. I followed a recipe retrieved from our Mother, which I found to produce a gritty, way to sweet dessert, not really to my liking. But my partner said she loved them. And she did. I've made Nanaiom Bars many times since then. The desire to improve the final creation was an annual pursuit (at Christmas of course) trying a number of ingredient combinations through our years in Montreal and then Vancouver Island. And it was while living in Victoria, just 60 miles south of the fabled origin of the Nanaimo Bar, that I decided to get to the root of this treat. Research woud offer that Nanaimo Bar competitions were seeking the World Champion Nanaimo Bars right in the City of Nanaimo. An event that went on for years and years. And for many of those years one single lady scored the top prize. We do know she was still living when we were in Victoria. It was during a dinner party at our home in Victoria, a balmy Christmas day as I recall, the dessert tray was placed on the table, picked over and sat almost empty while our guests struggled to swallow cheeses with strong coffee at the close of a wonderful dinner. One of the gals asked if I'd made the Nanaimo Bars. Answering I had indeed attempted to out-do the past year's creation, she said "You're not using Bird's Custard powder!" I didn't know didly of Bird's Custard Powder. It was about a week later that she sent me this recipe for Nanaiom Bars (calling for Bird's Custard Powder) and informing me that this single ingredient would help to create the best Nanaimo Bars I'd ever tasted. Last evening my partner was at a ladies evening with friends celebrating the the holiday break and wishing each other the best for Christmas. And I was here in the house working on Nanaimo Bars. Just prior to typing these past two paragraphs I went to the refrigerator and cut a small piece from the tray, asking her to sample it. As she bit into the Nanaimo Bar she closed her eyes and an "mmmm" escaped her lips. Her shoulders shrugged slightly, followed by a second "mmmm". "Those are wonderful." she said, a beautiful sugar satiated smile on that wonderful morning face. We believe using the Bird's Custard Powder eliminates that grainy consistency found in many Nanaimo Bars. And it helps to blend all of the flavors more smoothly. I too tasted a tiny bite of the slice I gave her this morning. And it was very good. The recipe follows here. Give it a try and send us an email. We'd love to hear your opinion too. In a saucepan combine 1/2 cup buter, 1/4 up sugar, 5 Tbsp. Cocoa, 1 egg, and 1 tsp. vanilla. Cook over medium heat, stirring constantly, until smooth and slightly thickened. Stir in Graham wafer crumbs, coconut and walnuts. Press into prepared pan. Cream 1/4 cup butter. Gradually beat in icing sugar, custard powder, and 1 egg (beaten to light and fluffy stage). Spread over the crumb mixture and allow to chill in the refrigerator for at least 15 minutes. Over hot water, melt 1.5 Tbsp. of butter with the 4 chocolate squares, stirring with a whisk until very smooth. Spread over the top of chilled mixture and return to chill.